A world class attraction just outside Edinburgh situated on the Union Canal. 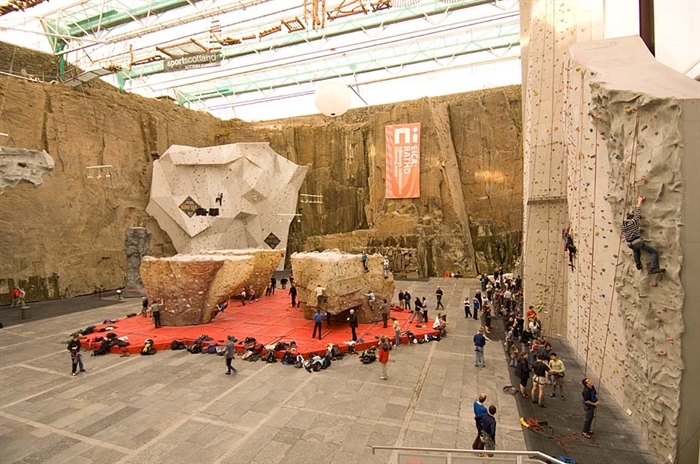 A state-of-the-art facility that’s been sculpted and hued out of a derelict quarry – a real climber’s paradise. And there’s heaps of adventures for the whole family too. Sky’s the Limit in Scotland! 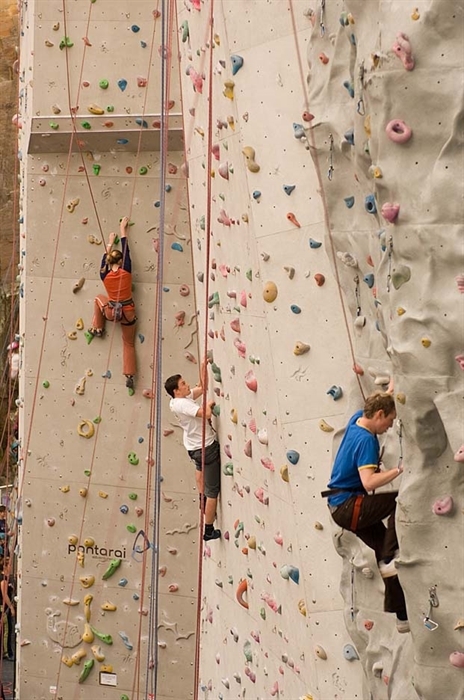 A great adventure destination for the whole family, the EICA (Edinburgh International Climbing Arena) is Europe’s largest indoor climbing arena and is packed full of fun activities for all ages all under the one roof. Whether you’re a dedicated climber or a family looking for a great day out, the EICA is for you. A world class attraction just outside Edinburgh situated on the Union Canal showcases a striking feat of engineering and architecture craftsmanship. A state-of-the-art facility that’s been sculpted and hued out of a derelict quarry. For climbers the EICA is home to the only IFSC (International Federation of Sport Climbing) world standard speed climbing and difficulty wall in the UK as well as numerous new easier routes on slabs. There are over 11,000 bolt-on holds in the centre, with 300 routes ranging in difficulty from grades 2 to 8b. But there's lots more adventure and adrenalin-rushing fun for the whole family and climbing enthusiasts alike. Clip ‘n Climb at EICA - children and adults can challenge themselves on the Stairway to Heaven, the Vertical Drop Slide, Astroball, or any of our 15 exciting and colourful climbing elements. You’ll have an amazing time whether you’re 4 or 84! No experience necessary – just Clip ‘n Climb. Walls on offer range from 12m to 28m in height. Aerial assault - Are you brave enough to take on the aerial assault? Take a leap of faith and step off a platform 100 ft above the arena, fly down the death-defying twisted zip slide and then follow a series of formidable obstacles. Abseiling - Why not really test your head for heights and lower yourself down the front of the windows like Spiderman? From a platform above the arena, face your fears, step backwards and let go! Climbing - At the largest indoor climbing arena in the world, it's a bit of a given that you'll want to try out the mighty walls. From the 'Tower' to the 'Hanger', there is something for all the family to tackle. If you've never climbed before, there are taster courses available. Bouldering - After you've mastered climbing on the walls, try it without the hassle of ropes and harnesses. The boulders may not be as high but that doesn't make them easy. Mobile tower - If the kids aren't quite ready for the arena, the mobile climbing tower is an excellent way to get started for all those older than 4 years old. With the supervision of instructors and an auto belay system, they can swing down in the safety of a harness. Soft play - Babies, toddlers and younger children also get their fair share of thrills in Scrambles Softplay and Rock Tots Play Café for the Under 5’s. Honeypot Ceramics – paint your own pottery, make clay hand & foot or silver imprints, make jewellery, make your own soaps, bath bombs and other cosmetics and try your hand at glass fusing. And you can always simmer down or seek solace from the buzzing stations with some tasty refreshments. The Level 3 Café Refresh offers a range of healthy lunch options including homemade soups, as well as a variety of salads, tray bakes and great coffee. Relax and take in the spectacular view of the arena. Location: South Platt Hill, Newbridge, Ratho, Edinburgh, EH28 8AA.